In an age where Frozen is still the most beloved and popular (modern) Disney princess tale, it’s hard to imagine a film that could topple it. Tangled is still preferred by many as a better, more evenly-paced film, and Zootopia won people over with its beloved protagonist, Judy Hopps, but Frozen is still the king (queen?) of the Disney hill. However, it’s my prediction (and hope) that Moana will overthrow the icy film that has plagued many a parent’s sanity as Disney’s single-best animated film of the last two generations – princess, musical, or otherwise. Yes, I know that sounds hyperbolic. No, I’m not forgetting about The Lion King. If anything, Moana has earned a place at The Lion King’s table in ways Frozen never could, because I believe Moana is the movie of empowerment Frozen wanted to be. It’s no secret Frozen was plagued with massive rewrites and production issues, which is common for most Disney and Pixar films, but in the case of Frozen, those scars are visible in the end-result. Interestingly enough, such issues were also present in Moana’s production, and about 2/3 of the way into it, Disney brought Don Hall and Chris Williams on board as co-directors, the duo behind the Oscar-winning Big Hero Six, to help ease out the kinks in Moana’s story. And I think it was this creative decision that helped Moana become the near-perfect film that it is today. 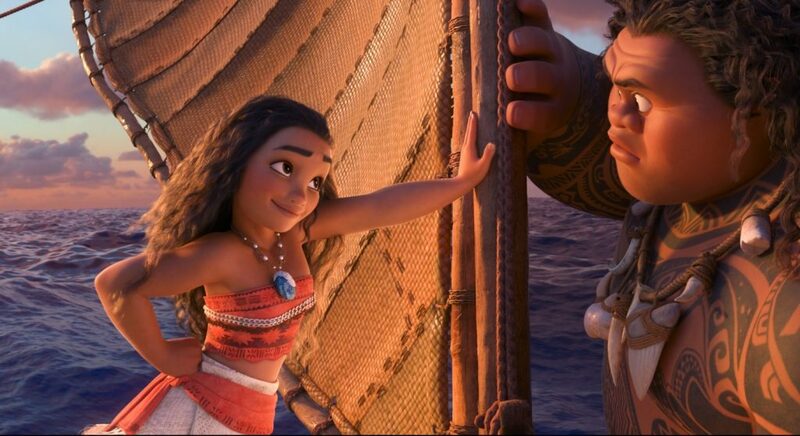 The dynamic between Moana and Maui is one of the best parts of the film. The funny thing is, I didn’t realize Moana is an animated musical, even though I grew up living and breathing on animated Disney films. I watched them on repeat, as many of my family and friends did, and they instilled a deep, deep love of music in my soul. I just assumed Moana would share more DNA with a movie like Lilo & Stitch (which has musical sequences but the characters themselves do not sing), but it’s actually far closer to the likes of Aladdin and The Little Mermaid (my personal favorites) – and for good reason! Unbeknownst to me before I sat down to see the film, Moana was directed by, Ron Clements and John Musker, the same duo that helmed Aladdin and The Little Mermaid. They also directed a few other favorites of mine, including Treasure Planet and The Princess and the Frog. With such a prestigious track record, it’s no wonder Disney brought them back to helm Moana, the duo’s first CG-animated film. But to dig into Moana’s story a little bit, this movie tells the tale of Moana (voiced by newcomer Auli’i Cravalho), a chief’s daughter (not a princess!) who is torn between the love of her people who will depend on her as their new chief, and the call of the sea, which has been calling to her ever since she was a toddler. This internal dilemma comes to a head when her island is no longer a viable place to live, so she goes on a sailing adventure (against her father’s wishes) to seek the help of Maui (Dwayne Johnson), a legendary demigod who is indirectly responsible for her island’s slow demise. SHE’S SO CUTE AND SQUISHY! This is the most basic summary to an incredible rich and dynamic story that is refreshingly original. Musker and Clements pitched this alongside two other ideas, and I’m so glad Disney gave them the greenlight for Moana, because it’s everything I could have hoped for in an animated Disney musical. The characters are expressive and three-dimensional. The mythology is deeply integrated and incredibly vibrant. Moana’s world feels like it really exists, both in terms of the story and the visuals. Disney’s team of animators really stepped up their game for this film, because it’s one of the lushest, most vivid CG films I’ve ever seen. The characters are highly emotive, and the environments are just staggeringly beautiful. I thought How to Train Your Dragon 2 was beautiful, but Moana elevates CG animation to an entirely new level. The film is also hilarious, helping you laugh after moments both tense and sorrowful which rival even the best of Pixar’s offerings. It’s not as depressingly sad as a movie like Up, but Moana will certainly pull on your heartstrings. The animal sidekicks are great comedic relief, but not overly done. 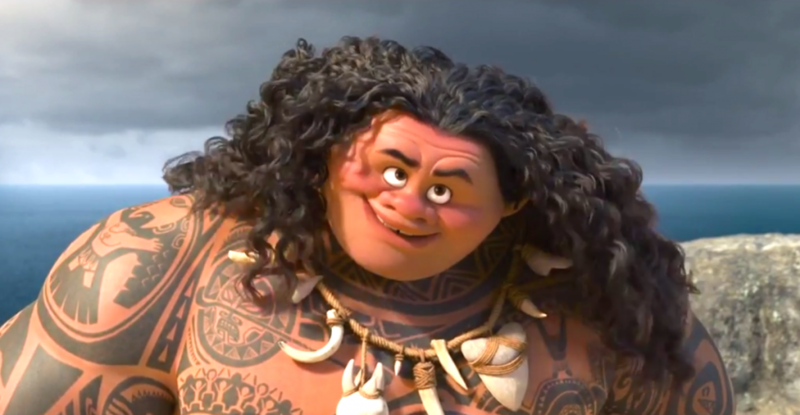 What sets Moana apart from Frozen, though, is that this movie fully revolves around Moana, even when she doesn’t realize she’s the hero of the story. Everyone and everything else work in concert together to help Moana realize her true potential, to help her understand what it means to be herself, what it means to own her name and live her own life as she sees fit. And what we get as the audience is a story that breathes life into us, and helps us remember that we’re worth more than anyone bargained for – thanks in no small part to Hamilton’s Lin-Manuel Miranda, who wrote the songs alongside Pacific music writer, Opetaia Foa’I. At this point everyone is a fan of Hamilton, the Broadway sensation that has taken the world by storm – but if you’re one of the few who haven’t gotten around to it, Moana is a great primer for Miranda’s unique style of rhythmic storytelling. A general complaint a lot of people have about musicals is that it doesn’t make sense for the characters to suddenly break out in song with elaborate dancing numbers full of props and extras – but you don’t really get that with Moana. What you get is an organic form of musical, one where it doesn’t feel strange that the characters are singing, because the songs are simply emotional expressions of what the characters are going through, both internally and externally. There is not a single song that feels forced or out of place, and for this I give Miranda full credit. You can feel his influence all over this movie, and it elevates Moana to musical heights Disney hasn’t truly delivered since its Renaissance heyday. Who knew The Rock could sing?! But you can’t have songs without music, and Mark Mancina’s score for Moana is the perfect backdrop for not just the musical numbers, but it taps into the deep undercurrent of emotion that runs through this movie. Previously, Mancina collaborated with Hans Zimmer on The Lion King, and Phil Collins on Tarzan and Brother Bear, and it’s audibly apparent that his experience with those composers/musicians influenced his scoring of Moana, and I think it’s very much for the better. Moana feels like a Disney movie because it’s written/direct by Disney veterans, and it sounds like a Disney movie because it’s scored by a man who has worked with the masters. Only time will tell if Moana topples the staggering juggernaut that is Frozen, but I believe Moana is going to become the gold-standard for Disney. From the characters and story, to the music and songs, Moana truly sets itself apart in every possible way and has established itself as an instant, timeless classic.